A process flowchart is a graphical representation of a business process through a flowchart. It’s used as a means of getting a top-down understanding of how a process works, what steps it consists of, what events change outcomes, and so on. 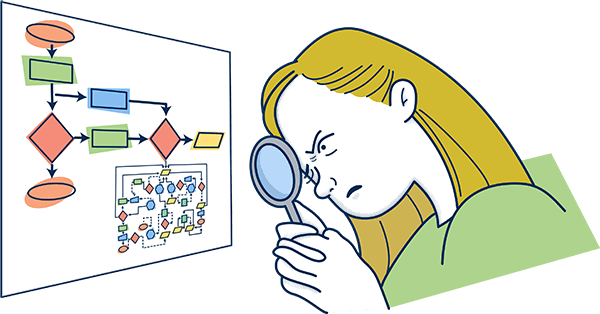 If you want to learn just about everything about process flowcharts, just read through the whole thing – we’ve got you covered. If you’re looking for specific sections, though, just jump over to whatever’s relevant! A business process is a series of repeatable tasks your business needs to carry out in order to achieve some sort of business goal. Flowcharts, on the other hand, are a means of visualizing the process. Process flowcharts are an essential part of business process mapping. They help visualize your processes, making them significantly easier to fully comprehend. Improving the Process – Once you know how the process works, you can figure out potential improvements. You could, for example, remove or automate certain steps. You can even completely re-engineer the process and fundamentally change how it works. Standardizing a Process – Unless you’ve documented your processes, your employees will figure out different ways to carry it out. 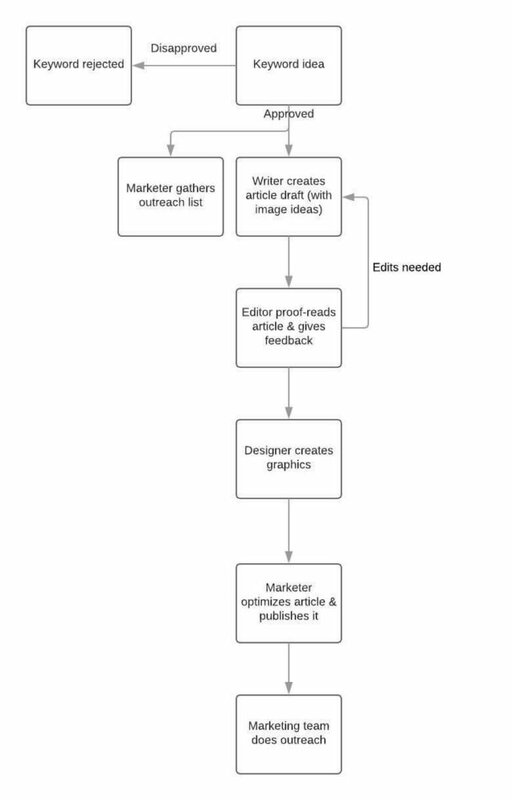 With a process flowchart, you can ensure that everyone’s on the same page about how the process should be done. Writing a Standard Operating Procedure – A process flowchart is just that – a flowchart. SOPs on the other hand, are a full documentation on how that process functions, how to carry it out, what tools or tech to use, and so on. To really get the most out of your processes, you’d want to go for all of the options we just mentioned. At a glance, this sounds pretty simple – just about everyone can draw a flowchart. Really making it accurate, though, isn’t all that simple. It’s one thing to look at the process from a management point of view; it’s another to actually understand what it consists of: the steps, methodologies, tools, and so on. Before you can even start learning about the process, you should make sure that a process flowchart is the right tool for the job. If your aim is process analysis from a more top-level perspective, you might want to use other tools. 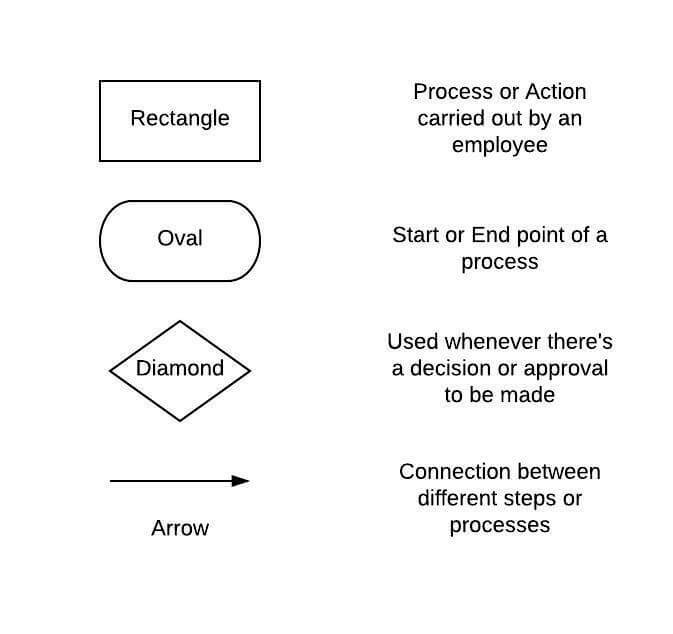 While process flowcharts are perfect for detailing the step-by-steps of a process, they’re not as useful for gaining a deeper understanding. 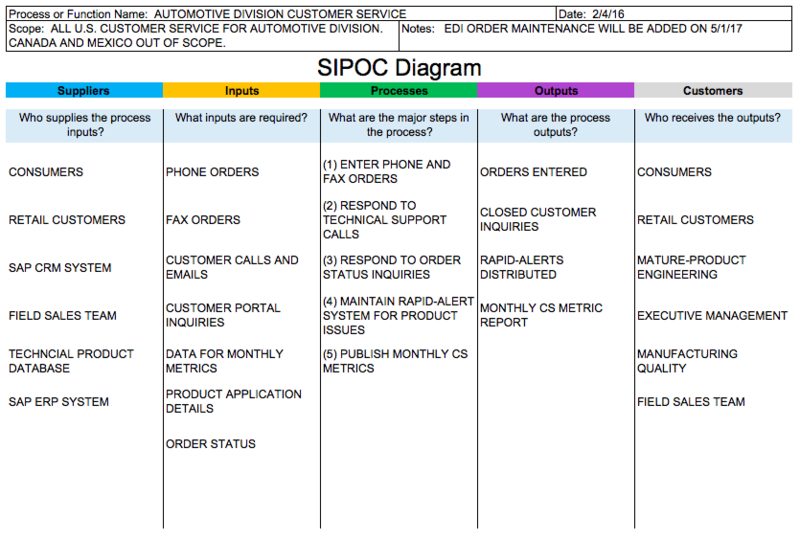 SIPOC diagram, for example, analyses the entire process of product creation and delivery. It’s divided into 5 parts – suppliers, inputs, processes, outputs, customers. If you’re looking for more top-level analysis tools, check out our guide on business process improvement tools. If not, read on! Unless you’re the one working on the process on a daily basis, you probably need to catch up on the details. So to really understand the inner workings of a process, consult shop floor employees. Set up a meeting and pick their brains. Who knows, maybe they’ll even have ideas on how to improve the process. Once you have the information on how a process works, you can actually start drawing the flowchart. A better (but more complicated) option, though, would be to use BPMN2. Business Process Modeling and Notation (BPMN) is a standardized methodology for documenting processes. Following the BPMN model makes it easier for your employees, management, as well as external consultants to understand the process map. If you’d like to go that route, you keep read our guide on BPMN here. Pen & Paper – The simplest option is to just grab a piece of paper, a pen and just draw the flowchart physically. Online Graphing Software – Chances are, you’re going to want the process flowchart to be digital. This makes it easier to make edits, share it with employees, and so on. To create an online flowchart, you can use a tool like LucidCharts. Business Process Management Software (BPMS) – While BPM software rarely helps create flowcharts, it does something even better. You can use BPMS to create digital processes, which you can either analyze or simply execute through the system. The software automates the process execution. Meaning, when a process step is completed, the next employee in line is automatically assigned the right task. You can create process flowcharts for just about any business process, whether it’s onboarding, sales, document approval, or anything in-between. To give you a better idea of how these look, we’ll cover 3 examples of process flowcharts of different business processes. Just about every company ends up hiring new employees. Onboarding is an essential step in getting them up to speed & educating them on how the company or department functions. Hence, it’s always a good idea to have a clear, structured process for this. Tech – software access, personal computer, etc. Welcome swag – Gifts, company t-shirt, etc. Need help creating your own onboarding process? Learn how to get employee onboarding done right! Getting all the right approvals for any document can be a major hassle. It involves a lot of emails back and forth, some of which end up getting lost or delayed. Having a procedure makes approvals significantly faster & more efficient. The following is a basic document approval process, and it can apply to just about any type of document (legal, hr, etc.). If the document is disapproved, process canceled. To make this process even smoother, you can use approvals management software. Instead of having to shoot emails back and forth, you’d just start the process through Tallyfy & the system will make sure everyone’s signs at the right time. Any company should have a contingency plan for potential incidents. While you can’t always predict what’s going to happen, you can have a strategy on how to react in such situations. The following process flowchart example is for a cyber attack. If you want to learn more, read up our article on incident response management processes. Creating process flowcharts, while useful for introspection, is only a start. You need to analyze the process, figure out potential improvements, implement them, and so on. After all, you really don’t get much by simply drawing the flowchart. To learn how to do all this and more, check out our guide on Business Process Management. And no, it’s not just another buzzword-definition article – we’re going to explain how, exactly, BPM can help you optimizes your processes.